Virgin Orbit, a new name for Sir Richard Branson’s Virgin Galactic satellite-launching business, now has its Boeing 747-400 airliner at Long Beach airport and ready for its final modifications in order to carry Branson’s LauncherOne rockets into space. The aircraft, called ‘Cosmic Girl’, will be fitted with external equipment which enables the 747 to launch its rockets from 33,000 ft (10,700 metres) into space. The final modifications will include a new pylon suspended under one of the aircraft’s strengthened wings. The project also has a female pilot, Kelly Latimer, who is a massively experienced former test pilot for NASA. Her task, she admitted to journalists, is not going to be easy. As well as having the rocket plus its highly-flammable fuel sitting under the wing, she will have to tilt the aircraft to “a rather extreme angle” in order to set the rocket – and its satellite cargo – on an upward path into space. “I think the challenges will be when we actually put on the pylon and rocket, and see what kind of drag and lift effects we have on that wing,” she said. “We know from the fluid dynamics data that there’s going to be quite a bit of drag added. We’re hoping that the prediction is close to what it really is, because -[if there’s more drag – then it’ll be a little bit challenging at high altitudes to get the speed we need to be able to pull the nose up. 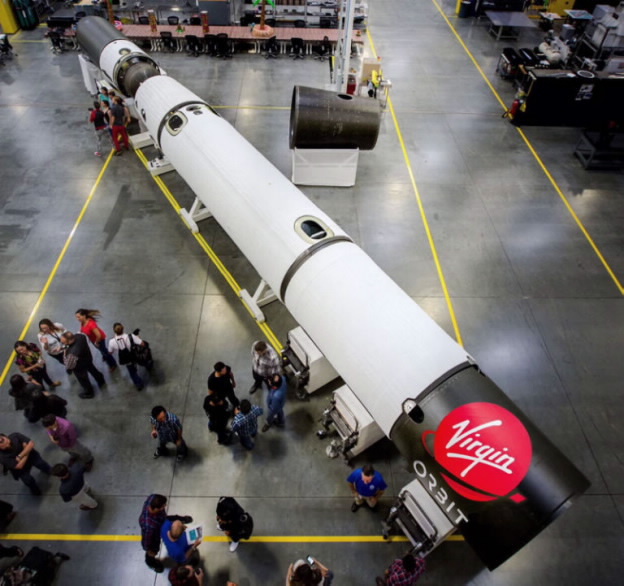 The aircraft provides huge flexibility for the Virgin satellite launch team. It can fly above bad weather, and maintain a rapid refresh rate as well as avoiding other ground-based – and more traditional – rocket launch activity. There will be some test flights from the nearby Mojave Space Port and scheduled for the first-half of 2018. But the real work is committed to launching satellite for OneWeb, where Branson is an investor, and holds a contract to provide 39 launches for OneWeb’s LEO constellation.